Posts related to the US Pharmaceutical industry, their costs and behaviors. Pharmacy currently consumes about 13% of the overall health care dollar. The U.S. is the only country without some type of price control on pharmaceuticals. The main argument about this is: if there are price controls on drugs, Research and Development will be curtailed and that would be detrimental to the American people. This, of course, is the time-honored response from Big Pharma. It’s interesting that there are a lot of European and Asian drug companies that market drugs in non-U.S. countries (with price controls) for years before they ever come to the U.S. and they are doing quite well with enough funds to do R&D and produce new drugs. Big Pharma in America never seems to be able to explain that. This is so ingrained that a U.S. Congressional white paper came to the same conclusion. Of course, all of our legislators are getting huge sums of money from Big Pharma, so this is no surprise. So, the whole R&D defense is a sham. DO NOT BELIEVE IT! What really drives the price of drugs is what Pharma industry executives blatantly say: “What the Market can bear”. The CEO of Gilead, which markets Harvoni, a drug that cures Hepatitis C, for about $100,000 for a 12-week course, actually said this in an interview. The person who created the drug (using NIH grant money, yes, your tax dollars) says it only costs $1500 to make. It’s kind of like “Do you want to live? Pay the price!”. This is not like what most businesses do when they price a product. Usually it’s what it cost to develop, what it costs to manufacture the product, what, if any, warranty adjustment needs to be added, and then a reasonable margin (usually a fraction like 5%, 10%, even 50-100%), not 67 times the production costs, in order to create a price point that their target market can afford. By the way, Gilead bought the rights from the guy who developed the drug (with your tax dollars); they didn’t even do the R&D!! A recent article in JAMA Internal Medicine has revealed that U.S. drug prices have no relationship to anything except what a Pharma company decides to charge. They consistently say they charge “what the market will bear”. Want to live? Pay $1 million. Or…die! Epinephrine has been generic for about 100 years!! So, how does Mylan get away with this? And how can this be called a brand name when it has been generic for years (Patents expire in 14 years). It’s due to your Pharma friendly FDA and USPTO (the Patent Office) and the rules they promote. That’s in another of my blog posts. And, if you research the Canadian Pharmacy system, you’ll see that there are several companies marketing the epipen there and the costs are about $120 for a single and $170 for a dual pen prescription, OF WHICH MYLAN IS ONE OF THE MANUFACTURERS!!! Here’s another Pharma game. A Pharma company is first to market for a drug either in a class of drugs or used for a specific condition. They price by “what the market will bear”. It has nothing to do with manufacturing or R&D costs. Six months later, a second company markets either a “me, too” drug in the same class, or a drug in a different class treating the same condition. What does the second company charge? THE SAME PRICE AS THE FIRST DRUG!! The rationale – the market was bearing the price of the first drug, so, why not price it the same? Restasis is that eye drop that has a lot of ads on TV for several years. 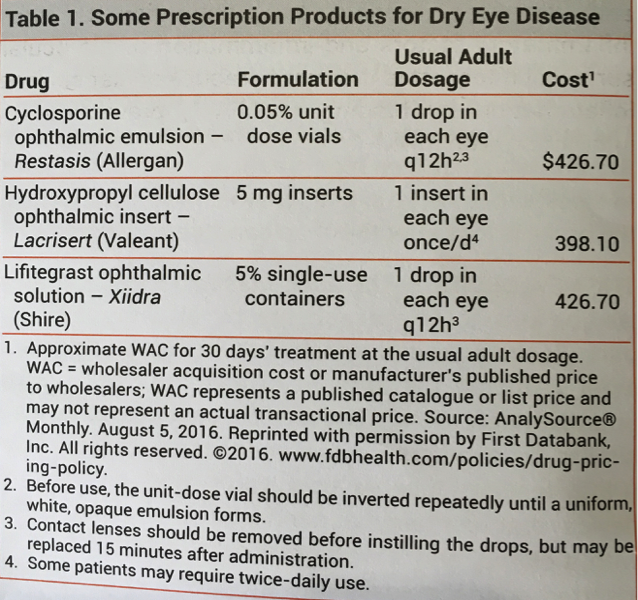 Recently another eye drop, Lifitegraf was approved for the same indication. Check out this table from The Medical Letter, a physician newsletter that gives physicians an unbiased review of drugs. It also shows you prices. First, hydroxypropyl cellulose drops are just artificial tears, not an active drug. The new active drug costs exactly the same as the first drug. How likely do you think the R&D and manufacturing costs and the margin calculations are identical for both drugs? Well, I’m hear to tell you they aren’t. The second drug company knew people would pay $426.70 so that’s what they are charging. Here’s another game they play. It’s supported by FDA/USPTO rules (which should be changed). The FDA and USPTO allows a drug company to have exclusive rights to make and market a drug for 14 years so the drug company can recoup R&D costs. Here’s how drug companies abuse this. There’s an aspect of organic chemistry that is at play with drugs because they are organic compounds. When the molecules are formed in the chemical reaction, you get two versions of the same compound, a right hand and a left hand version. Just like your own hands (and feet!) both your hands are hands but the spacial orientation is opposite. So you can’t put a right hand glove on your left hand, even though it is a hand. This is called a racemic mixture. It’s usually 50/50, just like your hands are 50/50. It turns out, in a lot of cases, one drug “hand” is not as active as the other “hand” or may not be active at all. However, you can separate the two. They are called “isomers”. One is the “D” isomer (right hand, “dexter”)and one is the “S” isomer (left hand, “sinister”). You can separate these from each other. Usually a simple process. What drug companies do is, they market the racemic mixture for 14 years so they can call it a brand, have exclusivity, and price it as they want and no one else can make it and they can get their R&D and marketing costs paid for. Then, as the patent is running out, they submit to the FDA and USPTO the active isomer as a new and different drug AND THE FDA AND USPTO ALLOWS THEM TO CALL IT NEW AND DIFFERENT and gives them another patent for 14 years! So the drug company doubles their time of exclusivity WITH THE SAME DRUG! All they have to do now is convince prescribers and the general public that the “new” drug is better than the “old” one (this is the marketing costs you see in the above figure). The classic example is omeprazole (Prilosec) originally developed by AstraZenica. When the patent for Prilosec was running out, AstraZenica got the FDA and USPTO to grant brand designation to the right hand version of omeprazole, esomeprazole (probably really desomeprazole or D-omeprazole) as Nexium. AstraZenica had been marketing Prilosec as the “Purple Pill” for 14 years. Overnight, Nexium became the “Purple Pill”. The only difference between Prilosec and Nexium is you only need half as much Nexium as you would need Prilosec, because the 50% non-active isomer was removed. $5.6 billion in one year alone (remember they got another 14 years for the same drug)! At the same sales rate per year over 14 years that would calculate to $78 billion on basically the same drug as Prilosec! No R&D costs! A mega-blockbuster! Guess what? You paid for this in your taxes (Medicaid and Medicare) and insurance premiums. Forty 20 mg Nexium prescription capsules cost $310.60 (goodRx.com). This was the cost for 14 years. Now, Forty-two 20 mg Over The Counter Nexium OTC cost $23.99 (Target, Wallgreens). The “market could bear” the prescription $310 cost for 14 years. Of course the doctors were 50% of the problem because they prescribed it. FYI, I never wrote a prescription for Nexium except when I saw someone else’s patient who was on it and they needed a refill when that physician wasn’t available. OK, so I hope you’re getting the point about Pharma. Pharma doesn’t care a whit about you. Pharma’s main goal is to make as much profit as possible. These are obviously stocks you want in your portfolio. Pharma contributes so much money to your legislators that they can get anything they want enacted, including FDA and USPTO influencing. Pharma prices drugs on “what the market can bear” irrespective of the ailment (I didn’t even get into things like cancer drugs but the games are the same) or the actual costs. FDA and USPTO rules allow perverse behaviors by Pharma. The R&D excuse for drug prices is totally absurd. 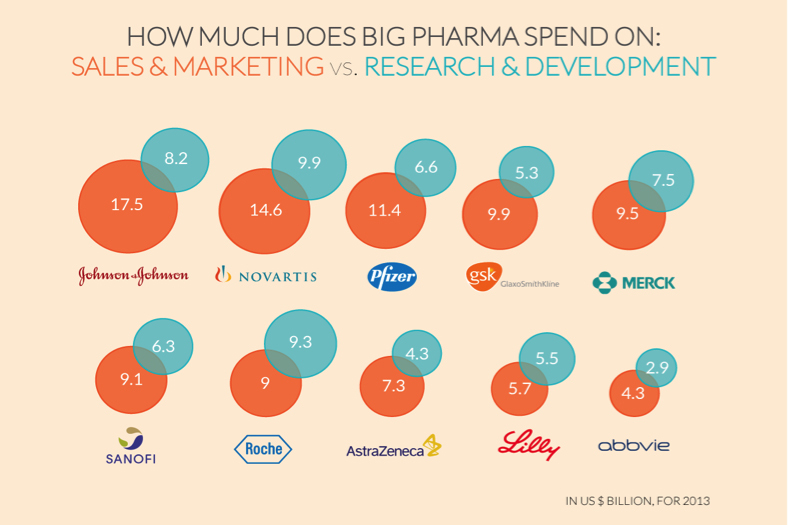 Pharma spends more on sales and marketing than R&D. By the way, 20 years ago, the main marketing approach for Pharma was convincing doctors to prescribe their drug. Many studies showed the biggest influencer of physician prescribing was not the medical literature but the extent of Pharma “detailing” (Pharma reps going to doctor offices with pizzas, holding evening dinners, sponsoring conferences, etc.). Then the court rulings related to the first amendment allowed drug companies to advertise drugs on TV to the general public. Sales jumped more with direct to consumer (DTC) advertising than advertising to the prescriber (doctor). Yes, doctors bent to the request of a patient who saw an ad on TV vs. going with the medical literature. And I guarantee the drug companies were pretty sure this was going to happen before they pumped tons of money into DTC advertising! Also, this is one example of why the free market enterprise system doesn’t work with health care because the stakes are different. It’s your life at stake. Because it’s all about the money. There is enough evidence for one to be very suspicious relative to the relationship between the FDA, the USPTO (Patent Office) and the Pharmaceutical industry. One can only imagine how much money from the Pharmaceutical industry is influencing the FDA’s and USPTO’s decisions. But don’t take my word for it, just Google “collusion between the FDA and the Pharmaceutical industry”. There are instances where the FDA has approved either human drugs or animal feeds that never should have been approved and there are allegations of collusion. There’s the fast tracking of drugs whose data doesn’t support approval. And more. I won’t repeat all of the concerns here. You can look those up. Allowing the same drug to be re-marketed as a new drug when it isn’t. Strongly supporting discarding all drugs according to an expiration date supplied by the manufacturer when studies show the expiration dates can be as long as 10-20 years. All of the above result in Pharma making astronomical profits for no reason. Remember, it’s all about the money. I’ve mentioned this one before. To recap, often, when a drug is synthesized it is a blend of two “isomers”. This means that the manufacturing process creates the exact same molecule except that the arrangement of the atoms in the molecule form in a right or left-handed arrangement. Test this out yourself. Hold up both of your hands. They both have a palm and five fingers and look the same except one has the thumb on the right and one has the thumb on the left, with the other fingers following suit. Your hands are “isomers”. They both do the same thing, they are just mirror images of each other. Well, drugs do this, too. The mixture of the two isomers is called a racemic mixture. Depending on which naming method a company uses, the drug has R (rectus/right) or L (levo/left)or D (dextro/right) or S (sinister/left) isomers. One major fact with most drugs is, one “hand” is often active and the other is inactive, whereas both your hands are active unless you had an accident, stroke or congenital anomaly. If you remove the inactive 50% (isomer), you only have to take ½ of the milligrams of the dose of the racemic mixture. It’s just third grade math. Instead of the FDA and the USPTO having a rule that the drug company should submit the approval for the drug based on its active isomer, the FDA and USPTO approves the racemic mixture with exclusivity rights. The FDA and USPTO should reject the second applications for the active-isomer-only on the basis that the drug is not new, just “filtered” or “sorted”. This goes hand in hand with patenting. A drug company gets a patent for the racemic mixture for 14 years. Then, as the patent is running out, the drug company separates the two isomers and the USPTO approves the active isomer as a new drug, giving the drug company another exclusivity period and the ability to call it something different and it is now a “new brand drug” for 14 more years! I wonder how much money changed hands there! Maybe they need an inservice from a PharmD! With this new FDA and USPTO approval, the drug company can now legally market the drug as a new drug exclusively. And charge prices that are up to 10 times the cost of the drug going off patent and now called generic, even though it is the same drug. The biggest offender is Nexium. Read about that in my first Pharmaceutical Industry post. The latest is Xyzal. There’s an ad about it 2-3 times an hour on TV. It’s drug name is levocetirizine. It is the left-hand isomer of cetirizine which is Zyrtec. Heard of that? Thirty-five Xyzal at Walmart costs $17.96 or 51 cents a tablet. You can get 180 cetirizine at Walmart for $29.86 or 17 cents a tablet. The only difference is….the dose. Cetirizine/Zyrtec is 10 mg and Xyzal is 5 mg. Exactly as you would predict. Same drug, three times the cost. And people will buy it because they don’t know it is the same drug, they think it is new and “better” because that’s what the ad is saying. Terrible!!! This should never be allowed. It’s a total rip off of the US population. Here’s some another examples. Back before 2013, inhalers for Asthma and Chronic Obstructive Pulmonary Diseases (COPD) had CFC’s (Chlorofluorocarbons) as the propellant in them. These are inert and don’t affect the actual drug performance. They affect the ozone layer, so they were banned. CFC’s just push the drug out. Almost all of the CFC inhalers were generic and cost about $15 per canister. After Dec 31 2013, the propellant had to be non-CFC. The drug companies switched the propellant to HFA’s (Hydrofluoroalkanes). Folks, this is merely the gas used to push the drug out of the canister! The FDA and USPTO allowed the drug companies to call these inhalers “new”, meaning they were again “branded” drugs with exclusivity. This allowed the drug companies to charge $30-45 a canister. The “generic” market completely disappeared because the CFC’s were banned. People with Asthma and COPD now either had to pay 2-3 times what they were paying or, if they had drug coverage with their insurance, they had to pay the “brand” co-pay, which generally went from $10 per canister to, generally, $40 per canister, a four-fold increase!! Overnight! Guess who made a lot of MONEY? Same active drug in the canister. 3-4 times the revenue for the drug company. Really? How does a propellant change warrant a 40 year old drug now becoming brand name again? For 14 years? This should never be allowed. It’s a total rip off of the US population. This is a sacred cow subject. As you all know, there is an expiration date stamped on every bottle of medications. You mean these companies couldn’t put a case or two of each of their medicines in a warehouse somewhere and tested them every 5 years until the potency was so low the drug wouldn’t be therapeutic anymore? Really? Of course not! People would keep their drugs longer and the drug company WOULD MAKE LESS MONEY! And, the FDA is very adamant that no one should take any medication beyond its expiration date, even though they must know the literature on this. They’ve developed “take-back” programs and scare the bejesus out of the general public into throwing their drugs away. The available research data supports expiration dates farther into the future than any drug company determines. And, except for one form of tetracycline from 1963 which is no longer on the market, there are no reports of a drug “going toxic”, which the FDA also proposes can be the case. A USA Today article cited that we throw away about 250 million pounds of drugs a year because they “expire”. Now, there are some drugs you don’t want to take after their expiration dates. Some degrade quickly. These are mostly drugs in liquid form, like epinephrine, certain IV antibiotic drugs or drugs that have to be reconstituted from a powder. Insulin is another one. Another category is drugs with narrow therapeutic indices or unique handling in the body. For example, if you have to have a blood test to measure the levels of a drug in your body, you shouldn’t take these after their expiration date. Not because it definitely isn’t good anymore, it’s because the drug company hasn’t tested its degradation rate and you don’t know. And even a 10% reduction in a drug like Dilantin (for seizures) or digoxin (for heart problems) or warfarin (Coumadin) (for blood thinning) could get you in trouble. So, this issue is clearly due to the Pharmaceutical industry refusing to do these studies so people know the truth. And the FDA doesn’t mandate that the drug company needs to provide that data. They should, as part of the approval process, mandate potency and, I guess, toxicity testing for at least 20 years from the initial manufacture date, i.e., the first couple of cases of the drug should be saved and tested. But, Noooo! Let’s just throw the stuff out so the drug companies make money from providers and patients disposing of and re-buying drugs to sustain the drug companis’ double-digit profits. After all, it’s all about the money, not the truth. Addendum September 21, 2017: So, if you think this is just me ranting here’s a reference for you backing up whatever I’ve written in this blog-site. “Strategies That Delay Market Entry of Generic Drugs”, Kerstin Noëlle Vokinger,MD, JD, et al; JAMA Internal Medicine Published online September 18, 2017. Pretty much saying the same things I am, but more eloquently. The FDA and USPTO facilitates Pharma making as much money as possible.